The finale of Miss World 2018 is finally happening in two days and we can not wait to know who will be crowned the new international queen. 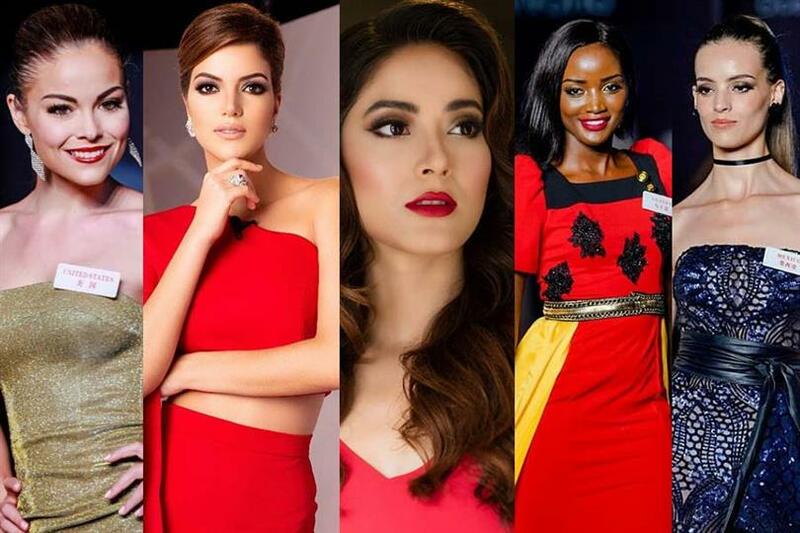 The preliminary round of Miss World has already ended and 14 contestants have proceeded to the finale the Top 30. Marisa proceeded into the final Top 30 of Miss World 2018 by winning the sports challenge. The 24-year-old Investment Executive Assistant has been a very active delegate from the very start. Marisa has ambitions to run her own business and study for PhD. The 173 cm tall model has a degree in Economics with a Business Minor. She is also musically talented and is a classically trained vocalist. This American beauty is of French, English, Scottish, Irish and Native American (Mic Mac) heritage. She is one of the strongest contestants which makes her Angelopedia’s favourite. Quiin has been a very consistent delegate since the beginning of the Preliminary rounds of Miss World 2018. The 22-year-old created history by becoming the first Ugandan woman ever to proceed to the final Top 30 of the competition. Quiin is a student who will be taking admission to Makerere University Business School to pursue a Bachelors Degree in Business Computing. She is multilingual with the ability to speak fluently in English, Luganda and Lusoga languages. Quiin has her goals set to become a top chef as well as a businesswoman one day. During her free time, she likes to read and travel. Quiin is a very versatile woman which makes her one of Angelopedia’s favourite contestants. Vanessa is the beauty with brains in this year’s Miss World batch. The 26-year-old Degree in International Business and is currently on the Board of Directors of a Rehab centre for girls. She is a volunteer and model by profession. Vanessa is an excellent speaker and she speaks for the National Youth Institute. Vanessa is bilingual, as she is fluent in both English and Spanish languages. Her dedicated and hardworking nature speaks in length about how well she deserved the crown, which is why she is one of Angelopedia’s favourite contestants. Shrinkhala is one the most sought after delegate this year which fan going crazy behind her delegacy. The 23-year-old beauty won the Miss Multimedia challenge as well as the best Beauty With A Purpose project which earned her a position in the final top 30 in Miss World 2018. Shrinkhala has a Degree in Architecture and is working as an Architect. She is the National Chancellor for the International Association of Educators for World Peace and aspires to become the first female Prime Minister of Nepal. Shrinkhala is also the president of The One Home Foundation. She likes writing, reading, travelling and tracking during her free time. Her diverse set of talents makes her one of Angelopedia’s favourite contestants. Veruska is 27 years of age and one of Anegeloepdia’s Top 10 favourite delegates for the crown. She is a model and a pastry chef by profession and stands tall at a height of 177 cm. Veruska graduated as an Advertising technician and is currently working as a TV presenter. She likes to swim, jog and go rock climbing during her free time and loves taking part in Venezuelan traditional folklore dancing. She also has a keen interest in art and literature. It is her wide set of interests that makes her one of Angelopedia’s favourite contestants. Twenty-four-year-old Taylah Cannon is the official representative of Australia in Miss World 2018 and if of French, Italian and Spanish descents. She is a professional vet nurse. She was placed in the Top 32 in Top Model competition. The representative from Oceania, in our opinion, can be this year’s continental beauty from Oceania as well with her gorgeous looks and sincere performance till now in the competition. The 22-year-old Brazil’s candidate Jessica Carvalho has already proved her mettle by being placed in the Top 32 in Top Model Competition and Top 25 in Beauty with a Purpose competition. Talk about a perfect blend of beauty and a brain, Jessica is currently studying medicine. Being an advocator of mental health, Jessica has made quite an impression during the preliminaries of the pageant and is, therefore, one of our favourites for the crown. Being the first delegate to enter Top 30 of Miss World 2018, Maëva Coucke has to be one of the favourites and strongest contestants in the pageant this year. The French beauty is also interested and passionate about Fashion which is quite apparent with her gorgeous styling choices throughout her social media. With her strong foothold in the competition, Maëva is surely a tough one to beat. The 26-year-old Filipina beauty Katarina Rodriguez is another strong contestant for the title. Even though she failed to place in the Top 30 through a head to head challenge, the Filipina fans are still not discouraged and Katarina placed in Top 32 in Top Model Competition. The gorgeous beauty has a heart of gold and with her splendid performance; she sure will be a tough competitor. The 18-year-old Asian beauty Tran Tieu Vy is one of the youngest yet strongest competitors this edition. She placed in the Top 32 in Top Model Competition and is quite a down to earth person. Tran Tieu likes to cook traditional Vietnamese dishes, travelling and exploring new places and cultures. With her sincerity and dedication, the Vietnamese beauty will definitely give a strong competition to other ladies in Miss World 2018.